Taking a Chance Is Coming Back! I am so excited to report that “Taking a Chance,” our short story from last year’s Charity Sip Blitz, is being re-released November 20th. Stay tuned, and visit me on the Torquere Press LiveJournal for more information! There’s An Alien In My Office! I’m over at Romance for the Rest of Us, the blog of Torquere Publishing. As I am remodeling and preparing to move, I am reminded of The Basics. All Romance eBooks is celebrating June Pride Month with features on LGBT authors and their books. Be sure to stop by and check it out! Join me over at the ARe Cafe today for Pride In Space, about the challenges and unique opportunities of LGBT science-fiction and fantasy. Enjoy! Join me at the Torquere Press Blog, Romance for the Rest of Us, for my article on a headache remedy. Join me over at the Torquere Press LiveJournal today. I have several posts for your enjoyment, which will go live throughout the day; here’s the first: “A Journal of Two Writers – Inventing Characters in the Real World“. Welcome to the 2012 Torquere Press Charity Sip Blog Hop, to benefit the NOH8 Campaign. Be sure to visit the other participating authors in the hope this weekend, Friday November 9th through Sunday November 11th. 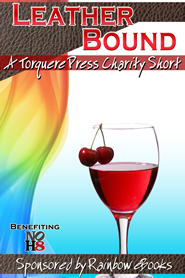 Torquere will be giving away a grand prize of a $50.00 Gift Certificate to the Torquere Books! You can click on the Charity Sip image to return to the Torquere Press Blog and the other hop participants. Remember to give some love to the authors in the comments. We love to know you’re out there! We are grateful to your support and readership. Together, we do make a difference. Our theme this year is “Leather and Love – How Romance Helps Stamp Out Hate.” When I started to write this post, the election hadn’t happened yet and the world seems different to me a few days later. We received some sobering news about a death in the family and it’s rocked all of us. I decided to share my thoughts, rather than write the upbeat post I originally planned, because I think it behooves us every-so-often to stop and remember what we are all one. Hatred solves nothing. Romance warms our hearts and sends our pulses racing. It can cross borders and cultures, as in the classic romance between Romeo and Juliet. Going back into antiquity, we have Helen of Troy, whose face launched a thousand ships and changed the face of the ancient world. Can we really doubt the fundamental nature of romance when such things are its fruit? I don’t have the words in me to express myself adequately in the wake of this week’s events. I think I’ll leave it up to the great Bard himself, whose own words surpass my keyboard even on a good day. What I do hope to leave you with, though, is the sure knowledge that love is the deepest power on earth and it can truly change the world. Welcome, my friends, and may you take joy with you today. It’s out! I’m so excited to bring you “Taking a Chance” today! It is available for purchase on Torquere Books and Rainbow Ebooks. Join me today at Romance for the Rest of Us, the blog of Torquere Press. My post, Silk and Linen, shares some of my favorite haircare secrets. I hope you enjoy!